While organic traffic is becoming more competitive and Google’s algorithms keep evolving, it is more important than ever for website owners to take action and not lose their rankings. One way is to take advantage of Googles featured snippet. When someone runs a search query in Google, sometimes a result will show up in a block at the top of the results. This block is called a featured snippet also known as a quick answer box. Included in the snippet is a link to the webpage, a summary of the search result, the title of the page, and the URL. They appear on the top of organic search below the paid ads. SEO companies strive to get ranked #1 for a search phrase, however, getting content as a featured snippet on Google is even better as it is considered to be position O. If you can get your content into a Google featured snippet, not only will you increase your visibility, you will get a higher organic click-through rate. How do Featured Snippets Affect SEO? Google searches bring up featured snippets before other organic results. Many people don’t go beyond the featured snippet resulting in much less traffic and fewer clicks to everything else on the first page. What this means is that SEO agencies need to expand their focus on getting their content to show up as a featured snippet to maintain their search traffic. What are the Different Types of Snippets? Notice that sometimes snippets for “how to” and “how do” and similar phrases are list-based and other times they are paragraphs or videos. Tables are often used for lists, statistics, and pricing. Google will sometimes pull only the most useful information from a page and create its own table in answer to a user’s query. YouTube videos are also pulled into featured snippets so be sure to optimize your videos as well. For example, you can answer your target audiences’ questions in the text of your video description and in the title. Depending upon the niche your business is in, will help you determine which type of snippet is best suited for you. For example, local businesses should try to get positioned for Google maps results. Stat Search Analytics found that featured snippets do not appear in the SERPs that display the local packinstead. If you are in a market that has a need for specific answers to frequently asked questions, you can use your niche-specific terms that provide an explanation or present your data in a table format. Ben Goodsell from SearchEngineLand.com reports that the click-through rate (CTR) on a webpage that has a featured snippet increases from 2% to 8%. This jump in CTA increases organic traffic by 677%. Aherf reports that 99.58% of featured snippets are pulled from pages that are already in the top 10 ranking positions in the SERPs. Moz reports that most featured snippets are triggered by long-tail keywords as was found in many studies. Phrases of six or more words tend to show more featured snippets. Focus more on high-volume search terms as they tend to get featured snippets more often than low-volume terms. If you aren’t already ranking for your search terms on page one of Google, your chances of landing a featured snippet are greatly reduced. What Questions Should You Answer? Choose one of the main questions your site is intended to answer. Using very basic language, type your question into Google search. Don’t use fancy or technical terms. Format your question as you would speak it. Take a look at any featured snippet that shows up in the results. If you see your competitor, refine the search term and make your answer better than theirs. Ahref’s suggests three ways to find and steal Google featured snippets. You can watch their video, read their blog post for a more detailed explanation, and see a summary below. Find and then optimize featured snippets that you already have and make sure you keep them. 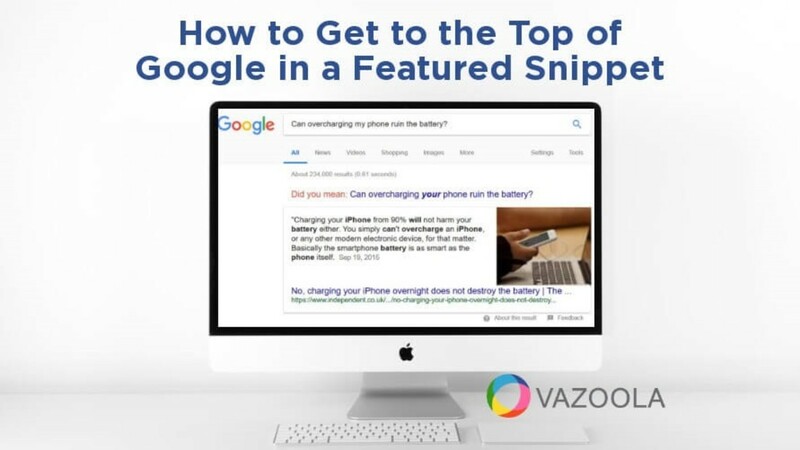 Optimize your web pages that are already ranked in the top 10 search positions to win more snippets. Find and steal competitors’ snippets by making your content and answer better than theirs. Rank Ranger offers a featured snippet tool that will provide you with a list of keywords and phrases that have already won a featured snippet for the top 20 competitors or the primary domain. For a more sophisticated approach, check out the Ninja Tools Featured Snippet Optimization Tool Ann Smarty covers in these featured videos and snippet resources. Include a how-to page on your website. Use easier-to-read shorter paragraphs with a subheading containing a long-tail keyword. Write posts in an FAQ style to maximize using question form keyword phrases. Start by analyzing and understanding the terms you are currently ranking for before you work on earning featured snippets. Your next steps should be to look at how your content is structured and re-optimize it based on the above suggestions. Be sure to hold onto the featured snippets you might already have to prevent competitors from stealing them. Look for low-hanging featured snippets opportunities. These are where you are already ranking in the top 10 search positions, as well as ones owned by your competitors that you can steal. Learn more about featured snippets, other important link building strategies, and how to build your link profile in our FREE Ultimate Link Building Guide. Download your own copy today.